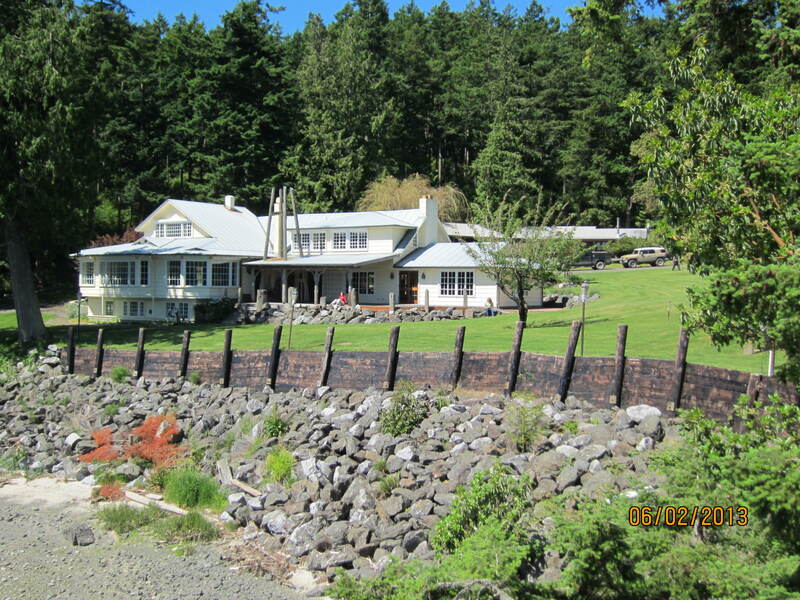 When John and Maia Vechey bought a waterfront house on Orcas Island six years ago, they immediately grappled with the idea of removing an old creosote bulkhead along the shore. The treated-wood structure was meant to protect the house from waves and erosion, but it was otherwise worthless. The bulkhead produced a horrible, pungent odor in hot weather, Vechey said. It also blocked easy access to the beach, and it did nothing to benefit the fish and wildlife that used the nearshore habitat. As the Vecheys pondered their options with the help of a landscape architect, concerns about sea-level rise came into play. Their final decision became fairly dramatic: Move the house back from the water, tear down the bulkhead, and restore the beach to a natural condition. “We know there is going to be sea-level rise,” Vechey explained. “Our intentions were always to do the right thing for the environment, the fish and the birds, as well as ourselves, so the decision became fairly easy." 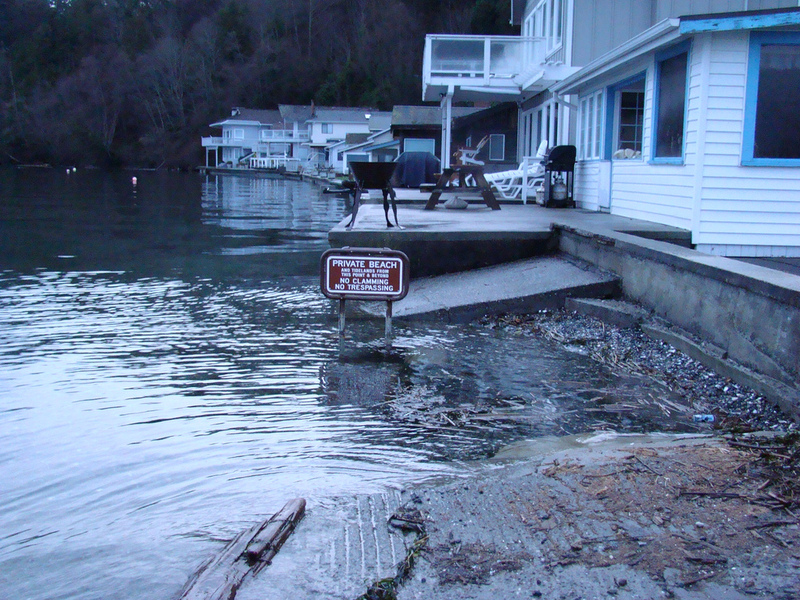 The threat of sea level rise, caused by climate change, adds a new dimension to decisions being made by waterfront property owners throughout Puget Sound. As high tides grow more extreme, shoreline armoring — such as bulkheads and other seawalls — may not last as long as they have in the past. And if they do hold up, they may be over-topped during the extreme high tides of the future. Not everyone will go as far as to move their entire house, but shoreline residents are confronting a new reality. Old approaches to shoreline protection may no longer be effective. While some property owners may want to take a defensive posture by building their bulkheads higher and stronger, many experts are urging residents to look at other options. Bulkheads and seawalls must be maintained through the years, Miller said. Defending against erosion is an ongoing battle against tides, waves and storms. And sea-level rise brings a growing threat to hardened structures. Hardened seawalls and bulkheads are also bad for the environment. Harm caused by shoreline armoring has been well documented. Extensive armoring can rob a beach of its natural sediment, leaving a coarse substrate unsuitable for forage fish, which require sand and small gravel for spawning. Clams may disappear as the sand and gravel is eliminated. Driftwood, which provides habitat for many small creatures, tends to drift on past properties with bulkheads. Dead kelp and seagrass, or “wrack,” that supports invertebrates eaten by birds doesn’t accumulate. Trees and shrubs that provide crucial shade to the beach disappear. The underwater habitat nearby is changed, too, and fish are less likely to be found near armored shorelines. About 27 percent of Puget Sound’s 2,500-mile shoreline has been altered with armoring, and about 60 percent of that armoring is located on residential waterfront property, making this is a top concern for planners and ecologists. When it comes to sea-level rise, one of the first things that property owners will notice is an increase in extreme tides, said Guillaume Mauger, a research scientist at the University of Washington’s Climate Impacts Group. Coupled with storm surges, higher waters could cause more tidal flooding and related problems. Years ago, people often built their houses as close to the shore as possible or right to the edge of a steep bluff, Mauger said. As a result, owners of such properties don’t have much leeway when higher tides bring floods and erosion on a scale never seen before. On the other hand, he added, sea-level changes are coming relatively slowly, and not everyone will experience problems at the same time. A variety of climate models predict huge variations in sea-level rise for Puget Sound, depending on assumptions such as whether people can reduce their emissions of greenhouse gases substantially in the coming years. In Seattle, the sea level has risen about 9 inches since 1900 and is expected to rise an additional 4 to 56 inches (4.75 feet) by 2100, according to a 2012 report by the National Research Council. Researchers often focus on a middle range of sea-level rise between 1.5 and 2.0 feet by the end of the century — although recent studies suggest that the high end of the range should be even higher, Mauger said. Additional information from the Climate Impacts Group about sea-level rise is available in the 2015 report State of Knowledge: Climate Change in Puget Sound. Experts say every property has a unique set of conditions — from the rate of erosion and the makeup of the beach to human enjoyment and ecological values. Sometimes — as in urban areas where real-estate values are high — the most logical option may be to create an engineered seawall that can withstand the natural forces. In some cases, the size of a property can limit the practical options. Moving a house may seem like a drastic step, Miller said. But recent case studies have shown that when all the costs and benefits are considered, relocating an existing structure to a safer location is not such a crazy idea. In other cases, an owner may already plan to tear down an old structure and build a new one, allowing a fresh look at where to place the home. Property owners who live in flood-prone areas may qualify for federal funding to move their houses or raise their foundations. Maps of these areas have been developed by the Federal Emergency Management Agency to define zones where the risk of flooding is 1 percent for any given year (the so-called 100-year flood). To address sea-level rise without adding a bulkhead, some people have proposed similar financial assistance for coastal areas likely to be inundated by seawater at some future date. The idea of removing solid walls along the shore or replacing them with so-called soft-shore protections has also gained momentum in recent years, as government funding comes through for shoreline restoration. In some locations, it turns out that old bulkheads were never needed, because the rate of erosion is very slow. In other locations, soft-shore protections — such as anchoring logs or rocks into a newly sloped beach — can be a practical alternative. The logs and rocks help absorb wave energy, with waves rolling up harmlessly on the sloping beach. Property owners often rave about the greater enjoyment they receive from a wider, sloping beach, which is also more environmentally friendly. It is yet to be seen whether the threat of sea-level rise will cause more owners to reject bulkhead removal or wish to build new or taller bulkheads, state and local officials say. Despite higher tides expected in the future, removing old bulkheads can still have advantages for both property owners and the ecosystem — although experts say future sea levels should be factored in. Because shoreline conditions vary from place to place in Puget Sound, some cities and counties have begun to incorporate knowledge of sea-level rise into their local plans — including shoreline master programs, comprehensive plans, zoning regulations and floodplain ordinances. Information is being coordinated through the Coastal Hazards Resilience Network, consisting of representatives from all levels of government along with businesses, environmental groups and academic researchers. The rate of sea-level rise will increase in the future, but right now it is just something to keep in mind while planning for construction near the water, according to Miller and others. Protecting one’s home against erosion today and sea-level rise tomorrow can involve many potential strategies, ranging from building a bulkhead to restoring a beach to just moving a house out of harm’s way. Assessing the specific risk faced by each property is key to identifying what protection measures are necessary. If the bulkhead had been left alone or replaced with something more substantial, sea-level rise would eventually eliminate the beach, which had already been narrowed by shoreline armoring, Vechey said. The beach restoration, which included planting trees and shoreline vegetation, received state and federal funds totaling $91,000, or about 40 percent of the restoration cost. Friends of the San Juans sponsored the grants through the Salmon Recovery Funding Board and provided some consulting work. Vechey said birds and wildlife already seem to be attracted to the improved shoreline. Boaters, some of whom have anchored nearby for 30 years, have told him that the beach looks a whole lot better. Vechey said he believes that people who own waterfront property have a special responsibility to protect and restore habitat essential to sea life. Not all waterfront property owners will choose to move a house, he said, but everyone can learn about natural systems and do something to better accommodate nature. This story was revised from its original version to add information about grant funding. Shorelines in Puget Sound are a key component of a healthy ecosystem, which is why so much attention is focused on protecting and restoring hundreds of miles of waterfront property. Shorelines support a multitude of species, linked into a complex food web, which ranges from eelgrass to invertebrates to forage fish to creatures that roam the deeper waters, such as salmon and killer whales. At the same time, shoreline properties — both public and private — provide outstanding recreational activities. Nearshore habitat is considered so vital to the recovery of Puget Sound that officials have called for a reduction in the total amount of shoreline armoring, which currently impairs about 27 percent of the Sound’s 2,500 miles of waterfront. The precise goal, established by the Puget Sound Partnership, is to remove more armoring — such as bulkheads — from the shoreline than what gets added over a nine-year period. As with other major goals to improve the Puget Sound ecosystem, a new Shoreline Armoring Implementation Strategy is being developed, this one put together by a team of experts over the past year, according to Jennifer Griffiths, an environmental planner with the Washington Department of Fish and Wildlife who led work on the strategy. Incentives and education for residential property owners: Recognizing that waterfront property owners may be concerned about erosion and loss of property, shoreline experts should provide information about the natural values of shorelines and erosion rates while identifying actions to help owners get more enjoyment from their property. Outside funding may be a key element. In addition, a general approach to education could help a greater number of people appreciate natural shoreline values. 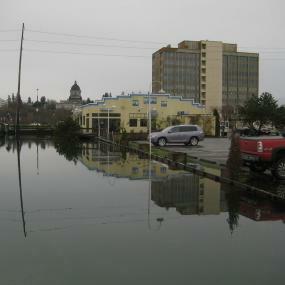 Regulatory communication, compliance and enforcement: While shoreline rules may prohibit new bulkheads except where houses are at imminent risk of damage, city and county agencies often face challenges in ensuring that the rules are followed as they go about encouraging alternative approaches and removing illegal bulkheads. The strategy calls for improving training and technical support for regulatory staff, implementing Soundwide monitoring for compliance, and increasing political support for implementation and enforcement. Technical training: A new bulkhead has long been an almost automatic answer to concerns about erosion — even in places where shoreline armoring is not needed. Growing evidence shows that bulkhead removal — including the possible addition of “soft-shore protections” — can provide a safe and more natural alternative. One key to making the right choices involves increasing the technical knowledge of regulators, designers, builders and property owners. Long-term strategic planning: Development patterns, roads and utilities, and climate change all influence whether shoreline armoring is removed, shored-up or even added over periods of 10 to 50 years into the future. Planning for the long run can save costs, protect the environment and identify new alternatives. Needed are better maps of the Puget Sound shoreline and identification of vulnerable areas and infrastructure. It could also help to share success stories as shorelines are restored and to find ways to apply new ideas to various shoreline uses. While the Shoreline Armoring Implementation Strategy is not yet completed, its recommendations were used to establish regional priorities for the upcoming Puget Sound Action Agenda. Once approved, the Action Agenda will guide development of specific projects over the next four years. A plan for adaptive management — the process of making improvements based on new information — has been incorporated into the Implementation Strategy. An annual forum is proposed to incorporate new findings and shift the strategy as needed in the future.